I volunteered to make a quilt with a class of 1st - 3rd graders for their school's auction fundraiser. The teacher kind of wanted pictures but I just don't want to put the effort into making a quilt with pictures because I am not convinced it will hold up to use and it is hard to get the general public to bid on a quilt that is so personalized. So, when I came across a tutorial somewhere on the web for raw edge applique I decided that was the way to go. Anyway, I wanted to make a sample so the teacher would have an idea of what I was talking about - she is not a quilter and the blank stare was a giveaway that she had no clue what I was talking about - so I whipped up this little sample. 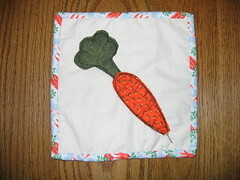 The first piece of fabric I saw in my scrap drawer was this orange which made me think carrot so that is what I made! I think it turned out very cute so I hope it will convince the teacher. She still wants a picture of the class on the quilt but I think it will go on the label on the back along with their signatures. I would love to give credit to whoever did the tutorial but I just can't seem to find it this morning so if you created it or have seen the tutorial (it was a cute little bird) please comment and I will add a link to it! Maybe it will come to live with Layden sometime. I love the carrot, maybe a rabbit or some radishes would go with it?